What did you like about the book? This novel has a ring of authenticity to it. I felt as if I was reading a memoir, probably because the author based the story on her own childhood. It is the 1960s in New York City, and Ruth’s family is struggling to put their life in Cuba behind them and embrace their new life in America. When an accident leaves the fifth-grader in a body cast for many months, her courage is tested as she endures loneliness and the indignities of being dependent on her mother for her daily care. 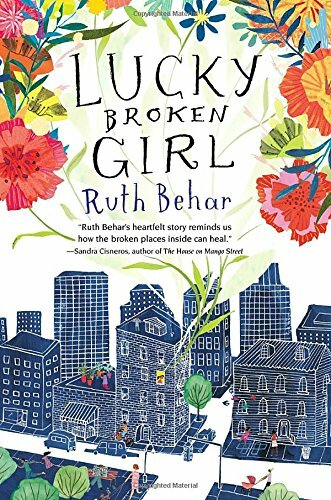 But gradually Ruth begins to draw strength from those around her: her Jewish grandmother and her stories of fleeing Poland during World War II, her bubbly “hippie” tutor, Joy, and her new neighbor Chicho, an artist from Mexico. The characters are realistic and flawed, particularly Ruth’s parents who can be dismissive and hurtful but also nurturing and loving. Intensely sad at times, the story is ultimately hopeful and should resonate with any reader who is enduring hardships of his or her own. Anything you didn’t like about it? I wish Ruth did not have to face so many difficulties in her life, but this is not a criticism of the book. Ruth is a wonderful character and role model. She should inspire young readers to have big dreams and work hard to attain them. To whom would you recommend this book? Read Alikes? Recommend to anyone looking for an inspiring story of triumph over adversity. Readers looking for another book about a girl who has to wear a cast for a long time might enjoy Just Like Always and its sequel Where Are You Cow Patty? by Elizabeth-Ann Sachs. Both are out of print but worth hunting for in used book stores or library collections. Readers seeking to learn more about Cuban culture should enjoy Enchanted Air by Margarita Engle and Island Treasures by Alma Flor Ada. Who should buy this book? Middle schools and public libraries should purchase this book. Should we (librarians/readers) put this on the top of our “to read” piles? Yes. This entry was posted in *Starred Review, Book Review and tagged Nancy Paulsen Books. Bookmark the permalink.